My little Spinners table topper (from Heather Mulder Peterson’s new book On the Run Again) was a breeze to make. What took me a while was cutting out the pieces. The pattern calls for a 60° triangle ruler, which I don’t have (note to self: buy one! ), so I cut out each triangle separately using the 60º marking on my favorite 4″ x 14″ acrylic ruler and the lines on my cutting mat. The more I work with these Kate Spain fabrics (from her Sunnyside line for Moda Fabrics), the more I like them. Happily, I have quite a bit left of the fat quarter packet I started out with, so I may use the fabrics for another project in Heather’s book. I’m not sure what company makes the aqua solid, since the fat quarter didn’t have any selvage information, but I have enough of it to bind the topper. 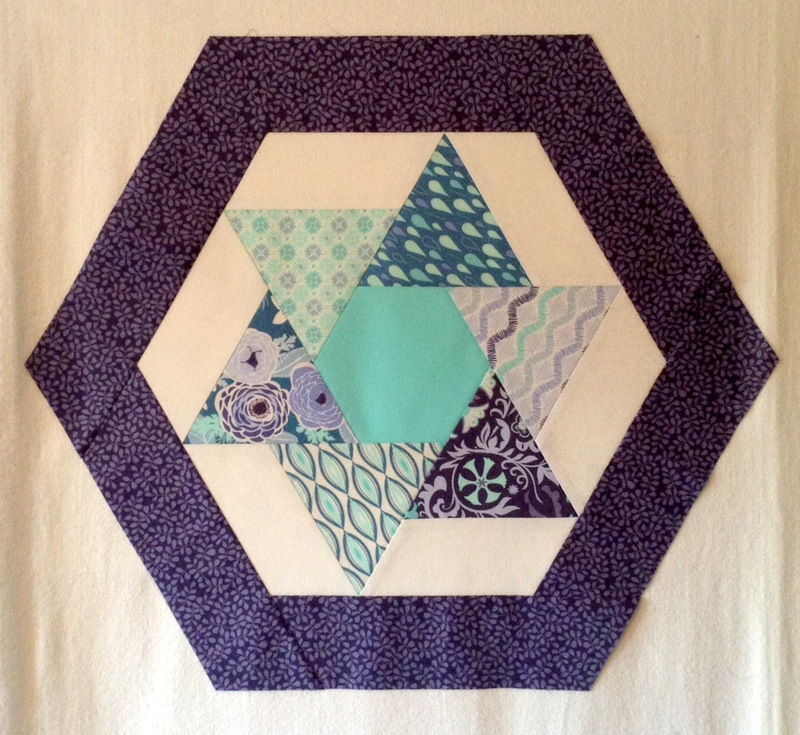 Now comes the hard part: how to quilt it? Copyright Heather Mulder Peterson. Used with permission. The way the fabrics were cleverly packaged by the shop, Pioneer Quilts, was a selling point. You can see why I can’t wait to get started! If you’d like to see more of the charming toppers and runners featured in Heather’s new book, check out her blog, Trends and Traditions, which happens to be one of my very favorites. I hope you’ll check back soon right here at First Light Designs to see the progress on my version of Spinners. Thanks for stopping by!